The past two months have been tumultuous for social network platform Ning. In March, longtime CEO Gina Bianchini was replaced by COO Jason Rosenthal. And less than three weeks ago, Ning’s bubble burst — the company laid off 40% of its staff and killed off its free service. Today the company, which ended its free service a few weeks ago, is rolling out the different paid models for its platform, Ning Pro, Ning Plus and Ning Mini. The tiered plans will be rolled out in July. Ning says that the new model will allow users to select which premium services they’d like to use, and possibly save users money as well. For example, the current premium model costs $55 per month and includes the option to Use Your Own Domain, Remove Create Links, and Run Your Own Ads. With the Ning Plus, you’ll be able to have them all for $19.95/month. 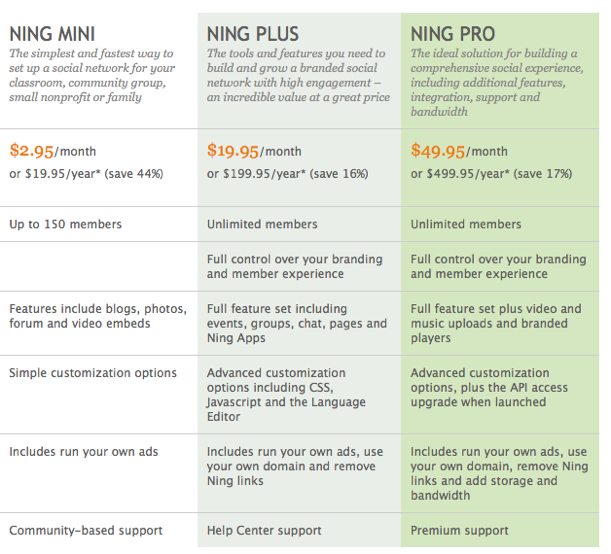 Ning will also offer current Network Creators a one-time annual pricing discount. And for Ning Creators who use the free service that want to move to another service, Ning will offer a tool to export all of content. Ning has also partnered with an education company that will be sponsoring Ning Mini Networks for educators in primary and secondary education, making Ning’s services free for certain educational institutions. Details on this partnership will be released soon. Rosenthal says that 75 percent of traffic comes from users who are using premium services, and is confident that this new pricing structure will satisfy users’ needs. The subscription model is a start to opening up revenue streams, says Rosenthal. He adds that Ning will be rolling out new ad share models and premium advertising in the next few months that should add additional revenue streams. He says that the DIY social network arena focusing on subscription model could represent a $4 billion plus revenue stream and with the new features, Ning is providing the most meaningful platform to capitalize on this market.